July 14, 2014, 10:11 a.m.
Last week former Alaska governor and Vice Presidential hopeful Sarah Palin called for the impeachment of President Obama, saying he is a "lawless, imperial president". Citing the use of military force in Libya, the IRS&apos;s investigation of right-wing groups and the recent migrant crisis at the border she called upon Congress to begin investigating the President in preparation for impeachment. The call has been widely rejected, however, including by the Republican Speaker of the House of Representatives John Boehner, who is currently launching a lawsuit against the President because of his allegedly excessive use of executive power. 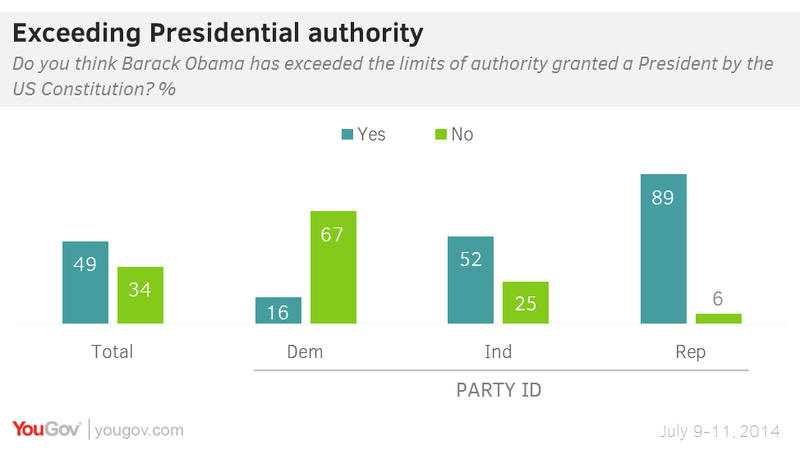 The latest results from YouGov show that 49% of Americans do think that President Obama has exceeded the constitutional limits of Presidential authority. 89% of Republicans say that he has, along with 52% of Independents but only 16% of Democrats agree. 67% of Democrats, along with 25% of Independents and 6% of Republicans, say that he has not exceeded the constitutional limits on his authority. 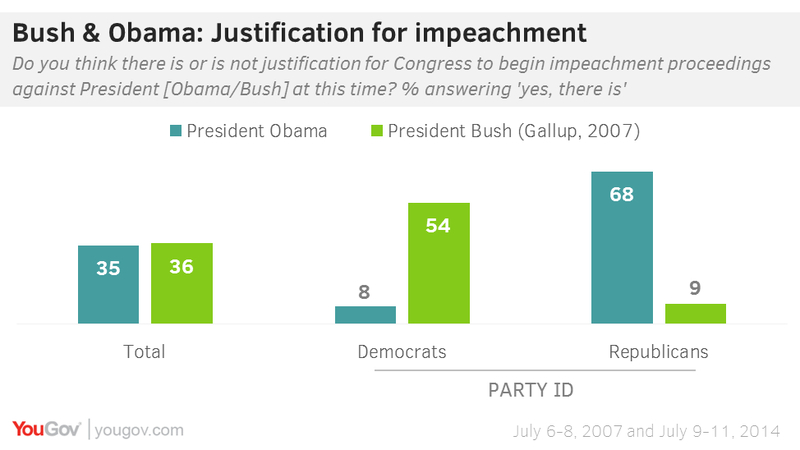 Attitudes towards the potential impeachment of President Obama are, overall, similar to attitudes towards the potential impeachment of President Bush in 2007. In 2007, 36% of Americans said that Bush had not abused his powers, while 39% say that same about Obama. 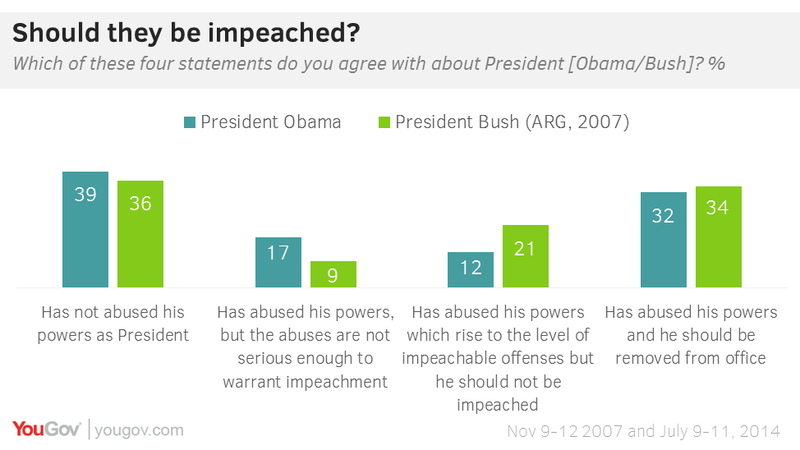 Similarly, 32% say that Obama should be impeached and removed from office, while 34% said the same about Bush in 2007. Perhaps predictably, these attitudes towards the impeachment of Bush and Obama differ significantly according to partisan affiliation. Most Democrats (54%) supported impeaching Bush in 2007, while 68% of Republicans today think that it would be justified to impeach Obama. Overall, 35% of Americans say that impeaching Obama would be justified, while 36% said the same in a 2007 USA Today/Gallup poll. The calls to impeach Obama have revived interest in the campaign during the last days of the Bush administration to impeach President Bush for exceeding his authority and lying about the Iraq War. Articles of impeachment were actually proposed by Democrats in Congress, most famously by Dennis Kucinich, but as with the push to impeach Obama the calls were opposed by their party leadership. Nancy Pelosi had ruled out impeaching Bush from the beginning of the Democratic congressional majority in 2006.